Ahava Leibtag (@ahaval) from Aha Media Group and I just published a sequel to our first white paper ("Three First Steps to Operationalizing Your Content Marketing"). This one is called Building a Content Marketing Operations Program and takes off where the first one ends — getting into deeper detail about process. I am particularly happy with the content lifecycle diagram that we developed and Seth Gregory designed. Marketing operations should be an iterative process that uses results to guide continual improvement. 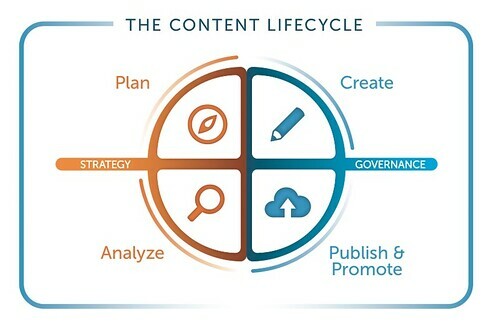 The lifecycle operates within the context of your overall content marketing strategy (who you want to reach and how) and governance (your constraints like style guide, budget, regulation compliance). Publishing is more than just saving content in your CMS. There is a very important "promotion" element to make content findable, usable and actionable. The white paper digs into those three themes and discusses the types of roles and skills that are necessary to be successful. Go ahead and download it. If you are intrigued and want to learn more, you can email me directly here or hit me up on any of the social networks that I participate in.